Where In My Home Should I Put These Kinds of Tiles? Thinking about remodeling your home? Want to change your flooring in various rooms? Sometimes, it’s hard to know what sort of flooring should go where. 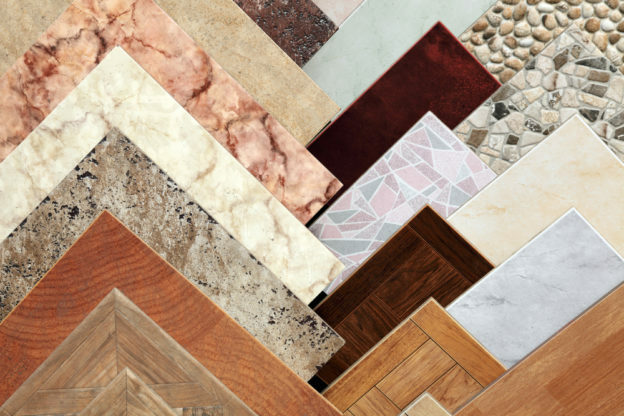 If you’re considering getting new tile flooring, you’ve probably noticed that there are so many different kinds of tiles. It might seem like there are too many! Where do these different kinds of tiles belong in your home? Hopefully, the info we’ve got will help you figure out what type of flooring you want to place throughout your house! This type of tile is absolutely beautiful. It’s got a nice reflective characteristic. This quality makes glass tile a great way to make a bold yet elegant statement. Glass tiles are durable and can endure the impact of sunlight, water, and extreme temperatures. They’re stain, mold, and mildew resistant. Glass tiles are also easy to clean. They work really well as a flooring choice for the kitchen and bathroom. You can also use them as floors or walls in the shower or as countertops. There are several kinds of tiles that give places a sophisticated look. Glass tiles are definitely amongst those options! You commonly see them in spas and salons, so, that should give you an idea of how nicely they can make a space look. This is a very common tile. It’s been used for several years and rightfully so. This type of tile can last between 10 and 20 years. Actually, it can last even longer if you take good care of it! Ceramic tiles are extremely reliable and cost-effective. They withstand the effects of stains, water, and humidity. This makes them a great choice for bathrooms and kitchens. They can also work well outdoors and on walls. Ceramic tiles are pretty easy to clean and maintain. You can use a mop, cloth, broom, or a vacuum to get rid of any dirt. These kinds of tiles are also really versatile. They can be made to imitate the appearance of hardwood or natural stone. You have a few different options to choose from when you’re working with porcelain tiles: polished, plain, and rough. They’re stain resistant and work really well in rooms where the temperature changes often. Porcelain tiles are more durable than general ceramic tile. Though the two kinds of tiles are similar in thickness, porcelain tiles are a little heavier than ceramic ones. Porcelain tile flooring doesn’t easily wear. So, it’s great for areas in your house where there is heavy traffic. These tiles are easy to clean and don’t require a lot of maintenance. You can use porcelain tiles for floors, walls, and even counters. They are good for bathrooms, including showers. They’re even great for outdoor areas of your home. Last, but not least, on our list of different kinds of tiles is granite. Granite tiles give a really sophisticated look to your home. You can use them to create a warm and elegant look to a room. These tiles are almost impossible to crack or break! This means less probability for repairs. They can be stained but are very easy to clean. Granite tiles are heat, water, and scratch resistant. There are plenty of colors and styles available, too. Granite tiles are good to use as flooring in the kitchen or bathroom. But, they can also be used in other rooms. They work well outdoors, too. Sometimes, people use these tiles in showers or as countertops. Ready to get some new tile flooring in your home? Now that you know a little more about various kinds of tiles, you can decide what you want to put and where. But, first, you’ll need to get rid of flooring you currently have. Dust Busters Floor Removal is here to make that happen for you! Contact us to quickly get your flooring removed so you can move on to your new, beautiful, tile flooring!